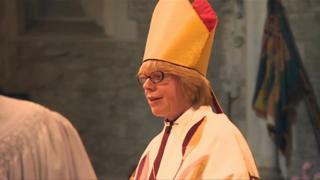 A woman bishop has become the first in the Church of England to lead an ordination service. Four clergy will be ordained by Rev Dame Sarah Mullally in Devon this weekend. They have spent a year as deacons but once ordained they will be able to perform weddings and lead Holy Communion services. Dame Sarah said it was "another step towards making women bishops a normal part of the Church of England". She said: "As a woman bishop it's a real privilege to be ordaining them. "It's another milestone and a great celebration." On Saturday she ordained Leisa McGovern and Sheila Walker in Ottery St Mary and on Sunday Glyn Lewry and Jill Purser will be ordained in Sampford Peverell. Dame Sarah, who was the fourth female bishop to be appointed in the Church of England, was consecrated as the new Bishop of Crediton in July. The Church of England consecrated its first female bishop during a ceremony at York Minster in January.